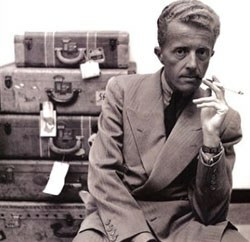 The mystery that surrounded Paul Bowles, then and now, seems to be the driving force of his artistic legacy. Tangier, Morocco is a city you sense long before you set foot in it. From the deck of one of the massive ferries that run from Algeciras, Spain, around Gibraltar, and then south to the north African port, you can smell sweet perfumes, pungent spices, and the musk of a bustling crowd, all mixing with the salt of the sea air as the ship steers toward the docks. A steady hum of traffic and lively shouting cuts through the slapping of waves against the hull. At least, this was my impression as a wide-eyed 21-one-year-old, leaning over the rail as a vast, inscrutable continent rose up to meet me. On an undergraduate study abroad program, I would spend two dizzying weeks traveling the Moroccan countryside, as far from home as I had ever been before, or since. As we stepped off the gangplank, our group was met by Mohammed, a student of English literature and our guide who, as he drove us to the hotel, told us proudly that he'd been studying with Paul Bowles. At the time, Bowles was a mysterious figure to me. I'd read The Sheltering Sky only after hearing the Police's "Tea in the Sahara", and couldn't say much more about him. Neither could Mohammed. Another student in our group asked if we could meet him, but our guide laughed as if we were asking him to produce a ghost. The mystery that surrounded Bowles, then and now, seems to be the driving force of his artistic legacy. 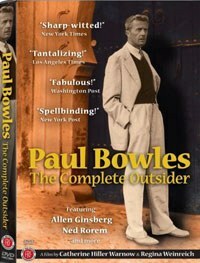 In their documentary, Paul Bowles: The Complete Outsider, directors Catherine Warnow and Regina Weinreich focus on Bowles as a man fundamentally at odds not only with his north African environment, but with the world at large. Through interviews and photographs, the film details Bowles' biography, beginning with his childhood in New York as the gifted son of a father who vigorously dissuaded Paul for pursuing his first love: music. Undaunted, he moved to New York City, where he began to make a name for himself as a talented composer, studying under Aaron Copland in the 1930s. Soon after, however, Bowles made his true mark, moving to Tangier after securing an advance to write a novel in 1947. Though he would return sporadically to New York, and though he would travel elsewhere around the world, the image of Bowles in self-imposed exile at the edge of the African continent is one that continues to fascinate his devotees. The film, for its part, devotes a large amount of time to '70s-era film footage of Bowles in Tangier, postulating about his position as a cultural oddity -- at home nowhere, yet likewise without sentimental attachment to any sort of distant origin. That Bowles chose to remain in Tangier, when so many other writers and artists would merely visit and then scurry back to their creature comforts, accounts, unfortunately, for his notoriety perhaps more than his considerable abilities as either a musician or a writer. The documentary, for example, offers scarce examination of his substantial body of written work, choosing instead to focus on the Bowles' eccentric life abroad. The extras, which feature the two directors discussing how they came to know Bowles, are of no help in this regard, either. To be sure, there is enough gossip in his life to fill a feature film. As a permanent fixture in what was, during the '50s and '60s, a popular and thriving scene for both down-and-out ex-pats as well as bored, wealthy travelers, Bowles became a sort of lynchpin for a variety of remarkable personalities. He was good friends, for example, with Gertrude Stein, who dissuaded him from writing poetry and took to calling him "Freddy" (Paul was a romantic name, she insisted, and he was no romantic). In addition, Allen Ginsberg and William S. Burroughs visited Bowles often (Burroughs lived for a time in Tangier), and Ginsberg goes on at length in the film about the "Beat" qualities that Bowles possessed (chief among these is his penchant for kif, a kind of Moroccan marijuana). This trait, perhaps more than anything, explains his attraction to Morocco. He reveals that his move to Tangier was as much to get away from America and its trappings as anything else. In this sense, then, Morocco seems the perfect place for him -- neither a wholly African nor Arab land, Morocco is a confluence of a variety of cultures that (with the potential exception of the Berbers) claim their homelands elsewhere. Still, the film reminds us, Bowles did develop enough of a connection to the country to become an active conservationist of rural Moroccan music and folk tale. As a translator, scholar, and archivist, his efforts worked to preserve a significant, though unrecognized, part of the national culture. More than a composer, more than a writer, and more than a preserver, however, Bowles, as this film reductively attests, is foremost an oddity, a slight man with a shock of white hair, moving amongst the souks and medinas of a distant, foreign land. Perhaps this characterization has lost some of its impact in this shrunken, globalized world, a time where travel by steam ship no longer exists to impress upon us the full impact of distance. As Bowles' writing attests, however, being such a traveler is a noble pursuit. He writes in The Sheltering Sky of a man who "did not think of himself as a tourist; he was a traveler . . . belonging no more to one place than to the next." Two weeks after I had arrived in Tangier, I sat in the back of a van heading north along the coast, the Atlantic on my left, the Sahara on my right. Speeding along the border of those twin infinities, I almost fancied that I knew what Bowles meant.